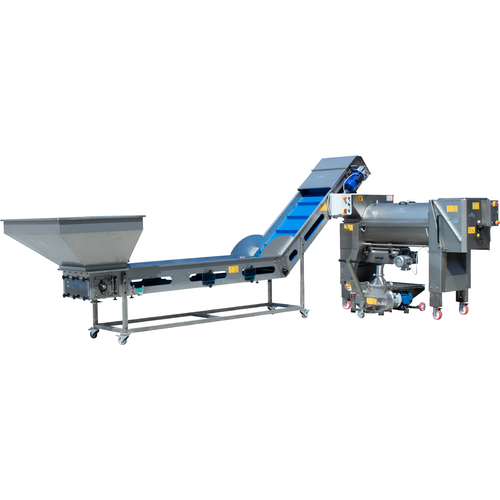 Enoitalia's top of the line complete Crush Pad including theJolly 100 Crusher Destemmer, a Gamma 180 Elliptical Rotor Pump, and a Sorting and Loading Belt. This system is designed to work together as a complete system with all components able to work within similar and complimentary processing speeds. A very flexible, adjustable speed loading and sorting table that offers multiple benefits. First the large bin is sized to accept a macro bin when used with a forklift and bin tipper. Then the unit uses a sealed food grade plastic belt to consistently and gently move grapes into your Destemmer/Crusher at an adjustable speed you set. This allows you to feed the Destemmer at the optimum rate without overloading it. The flat strectch of the belt allows for a person on each side to sort out leaves, bad bunches, etc.. Adjustable legs allows you to adjust the sorting table to the height of your Destemmer. Designed to feed grapes into the Jolly100. 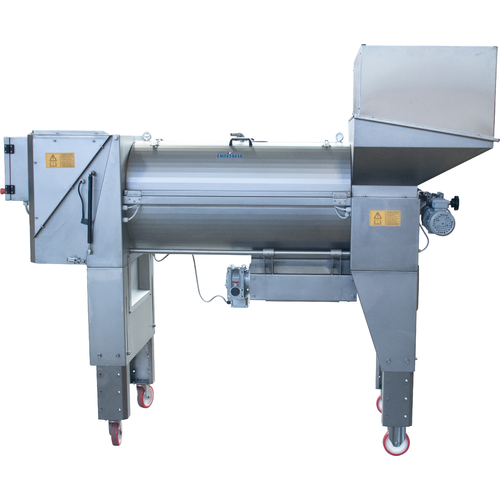 EnoItalia's top of the line Centrifugal Destemmer Crusher gives you the highest level of control when processing your grapes. It comes with three independent motors allowing you to dial in the perfect speed for your grapes. 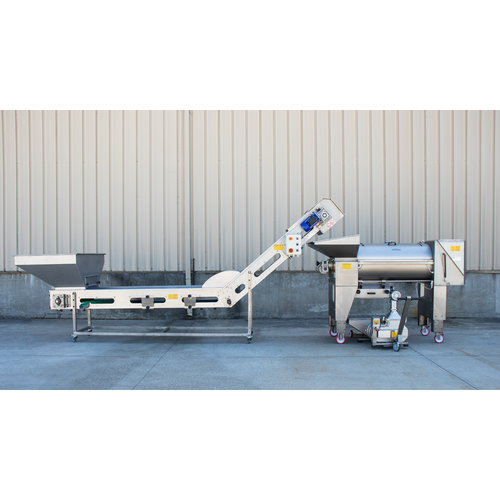 The loading hopper features mechanically varied motor that allows you to adjust the speed the grapes are being fed into the destemming chamber. The destemming basket and shaft are controlled by frequency drive which allows for the use of potentiometer to electrically control the speed. 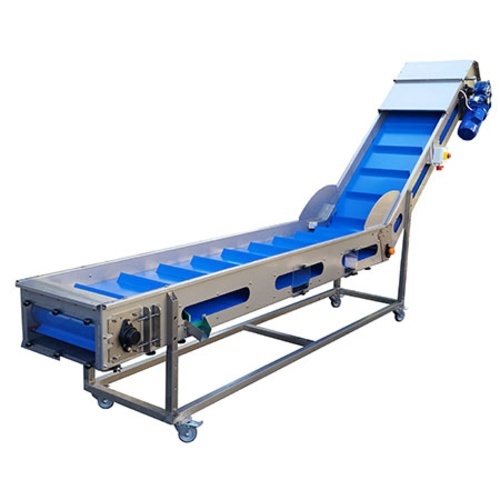 The rubber rollers are driven by an independant set speed motor and can be adjusted to change the gap, or even removed, if you desire destemmed whole grapes. Independant control of each process allows you to find the balance between speed and quality and helps the machine from being overloaded at any one of the stages. The stainless steel destemming basket is made with a gentle anti-tear design and is driven by rubber tip paddles to ensure a gentle touch on your grapes. The basket has a diameter of 15.75 in (40 cm) and a length 49.2 in (125 cm) and features 24/25mm holes which is the perfect size for a variety of fruit. Baskets with smaller or larger holes are not stocked but are available for special purchase. Enoitalia has tested other basket styles on the market, namely using a plastic basket instead of a stainless basket. Because of they way they punch and finish the holes in the stainless basket they have found there was no difference and the stainless steel lasts much longer. They have also made and tested baskets with variable size holes where the holes begin larger and end smaller with the idea that less jacks will pass. They can make this basket but they actually think it does not work as well. The receiving hopper features drainage holes with allows oxidized juice from the bottom your picking bins to drain. The machine has telescoping adjustable legs that allows the height of the machine to adjust from 60 in/135 cm up to 76 in/193 cm. Cleaning is easy for a machine this size. It features an integrated washing system (connect a garden hose) to help cut down on cleaning time. The top panels, over the destemming chamber, also open up on both sides to allow you to additionally clean with a spray gun. The cleaning system and the easy access are really handy for use between grape varietals, after a break, and at the end of the day when the basket and destemming bar are typically removed for a thorough cleaning. To remove the destemming basket and the bar the whole end of the machine (end with power controls) easily folds up via shocks allowing the destemming shaft and basket to be pulled out without the use of tools. It can be done with one person, however it is much easier with two because of the weight of the basket and bar. 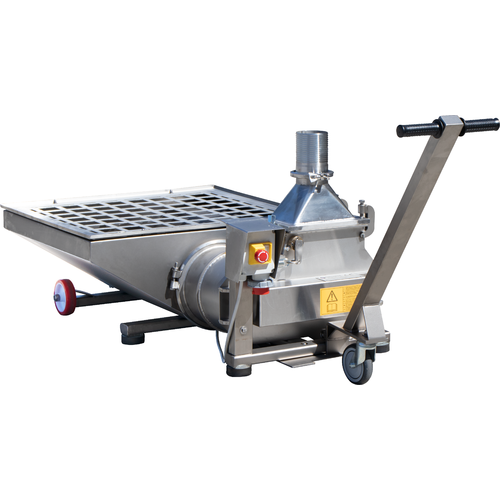 Designed to move crushed or whole grapes from the Jolly100 the Gamma180 is a gentle beast. Made from Stainless steel this elliptical rotor pumpis equipped with a large loading hopper and 4" outlet. it is suitable for pumping whole grapes, destemmed, and even fermented grapes during or after fermentation. Grapes are transferred by pressure and not by centrifugal force, avoiding the crushing of the peels and the grapes seeds. The stainless steel trolley with anti-vibration system makes it easy to move and install the machine. As standard it is equipped with an outlet open cone, inclined hopper, and removable control panel. In cases where a prevalence and /or high discharge distance is required, it is advisable to install a compression vessel. As standard, the pumps are supplied with a 4" TC connection fitting, complete with stainless steel hose connection. We don't sell 4" tubing, we recommend you purchase directly from a food grade tubing distributor for the best options and pricing.